There are monsters in the deep, beasts whose flesh is perfect obsidian, whose eyes shine like midnight stars and who yearn to hunt again beneath the open sky. These beasts are the drow, and it is their doom to never again feel the light and warmth of the sun, until such time as the elven gods are thrown down and all their favoured children slain. The cities of the drow spread like a cancer through the veins of the world, glittering jewels of decadence, soaked in blood and steeped in corruption. Ruled by great, matriarchal families and the will of the Dark Mother of Spiders' clergy, these cities are cosmopolitan nightmares, home to the worst depravities imaginable and swarming with untold legions of drow. While all drow have earned a reputation for cruelty and deadly cunning, none deserve it more than those drow who command the primal, arcane forces. 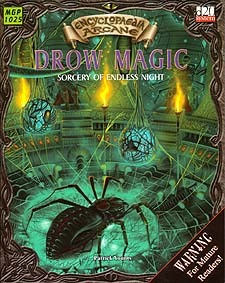 The Encyclopedia Arcane: Drow Magic shows you why. In this, the latest in Mongoose Publishing's line of books designed to broaden the horizons of wizardry in fantasy gaming, you will find a host of new options specifically designed with the sinister needs of the drow in mind. You will find page after page of new spells; spells which create living webs, which infect enemies of the drow with deadly soul poisons or virulent diseases, which summon up gibbering mounds of shadow to bite and tear at both flesh and spirit.